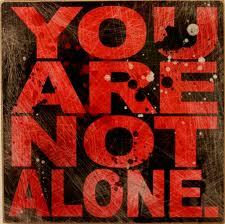 Perhaps the most meaningful thing about recovery -for me- is that fact that “I am not alone”. Throughout the ups-and-downs of the 20 plus years I have walked this journey, I have regularly attended recovery meetings. They have always been a safe place where I can honestly express how I feel without judgement or interruption. There have been dark times and happy times. I haven’t done recovery perfectly at all. In fact, many times I have felt like such a slow learner, not even able to keep hold of the basic tenets of the program. However, in the “big picture” the steps and the fellowship has been a source of great healing and comfort. Personally, I think the only thing worse then some of the horrid darkness that I have walked though in times past is walking through it alone. Since I got into recovery, I have never had to walk alone. There have always been meetings I could attend and tell my happy or sad truth. Furthermore, I never felt like I belonged anywhere. I either felt better or worse than everyone. In SLAA, I have learned that I am not unique. I am just another “Bozo on the bus”. A garden variety addict. I always gain something from other peoples shares. Sometime resonates as true and I feel connected and not alone. To those who are struggling alone in your darkness… I hope you gather the courage to come to the meetings… share your truth… be open to hear others. There is hope. You never need be alone again. Fridays 6-7pm LGBTQ focused Meeting, and all are welcome! 1 mile North of the Old Hickory Blvd./Franklin Rd. intersection. Enter church grounds from Lakemont Dr. Park in the back lot behind the main church. Enter through the glass door in the middle of the back side of the building. Also, the first Monday of every month is a step study. Park behind the building, on the street, or in the lot across the street in front of 1105. Enter through the front door; meeting room is on the south side of the building. Saturday Meeting - "The Breakfast Club"
Enter on the NORTH side towards the back of the Church property. Three large pillars will be on the right side as you enter the building. Meeting room is 106.